So how did we get here? Can you tell me about the birds and the bees? How does it all work? These are the big questions hinted at in “Life time” (Livets Gang), a commercial for Norwegian newspaper VG. A young girl plays with her doll house while her parents enjoy the coffee made by her grandmother. All of a sudden she has a desire to know more about what really goes on when a man and a woman sleep together. The mother is first to the newspaper to hide her face of delight as the father lands the question. “Daagen ir ikke helt den samme ten VG” (The day is not the same without VG). 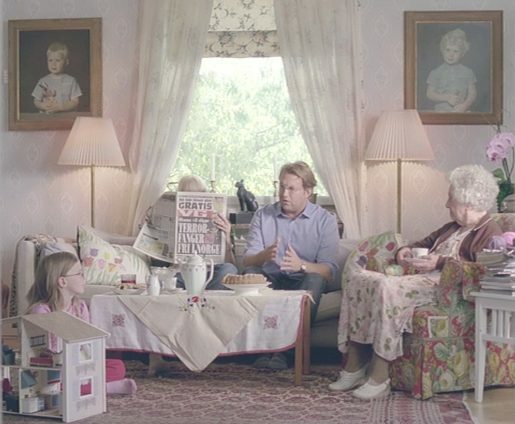 The VG Life Time campaign was developed at Dinamo, Oslo, by creatives Ivar Vereide and Morten Andresen, account manager Anniken Hallan, project manager Anita Engen Hjelset and agency producer Tonje Øslbye, working with VG campaign team Per Håkon Fasting and Knut-Olav Folkestad. Filming was shot by director Jesper Ericstam via Social Club with producers Johan Lindström and Magnus Theorin.